For the dip: In a medium bowl, stir together ingredients. Refrigerate until ready to serve. For the pickles: Place pickles on a paper towel-lined plate to dry. In a medium saucepan, heat oil to 400°. In a medium bowl, whisk together ale, flour, salt, garlic powder and paprika. 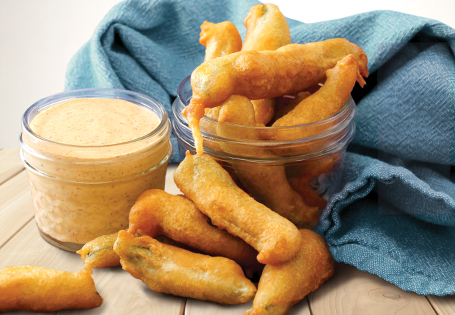 Coat the pickle wedges in batter and drop immediately into oil. Fry for 5 minutes or until golden brown. Drain on a paper towel-lined plate.